Unique design for this modern sculpture. Always at the cutting edge of elegance and aesthetics, with an exceptional lightness, this TV stand is the perfect pedestal for your TV screen. TV Size: 26" - 42"
VCM TV-Rack "Netasa black glass". Aluminum columns in elegant silver - Design. With 3 sturdy shelves made of 6 mm ESG-reinforced safety glass. All glass shelves are loadable up to 80 kg. Distance between the shelves: Below 21 cm, above 17 cm. Hidden cable management. Disassembled in carton incl. assembly instructions and assembly material. W.95 x D.42 x H.46 cm. Colour: Black glass. With 3 sturdy shelves made of 6 mm ESG-reinforced safety glass. All glass shelves are loadable up to 80 kg. Distance between the shelves: Below 21 cm above 17 cm. Shelf of tempered safety glass with polished edges. 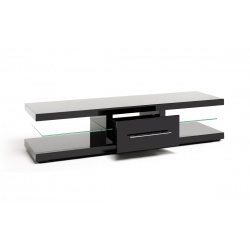 With its simplistic open design the Century TV Stand is both attractive and functional. It features two toughened glass shelves and central cable management for maintaining a tidy look. The Techlink SK-100TC Skala Corner TV Stand provides very attractive and solid support for up to 50" televisions, as well as all your AV devices. 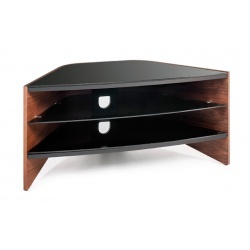 With a sleek, understated design, this brilliant TV stand will blend easily into any room corner. 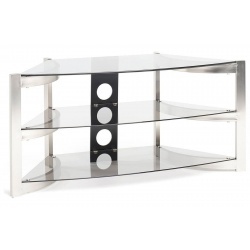 The brushed titanium and smoked glass create a strikingly light, floating impression that makes your TV and entertainment devices really stand out, the Skala Corner Stand represents an ingenious new style in modern furniture design. 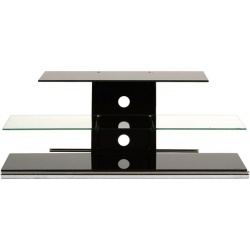 The Techlink Skala Corner TV Stand offers a two generously proportioned glass shelves under the top surface that will easily house all your necessary AV goodies, from DVD and Blu-ray players to games consoles and amplifiers. 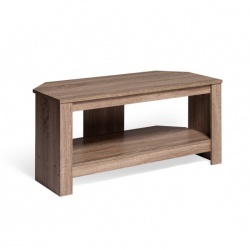 It looks great and it's got loads of space, but thanks to an efficient cable management system, the Skala TV Stand will keep all those rogue cables in check, adding to the smooth and uncluttered appearance of this fabulous piece of furniture. Keep your TV and entertainment appliances safe while making a feature of them with the Techlink SK-100TC Skala Corner TV Stand. Designed for flat panel Plasma and LCD screens up to 32"